Second Harvest Asia’s Yusuke Wada visited Taichung Food Bank (TFB) in Taichung, Taiwan on Oct. 11, 2013. Taichung Food Bank is the largest food bank in Taiwan founded by a local Red Cross Chapter and the Taichung City Bureau of Social Affairs. This joint-venture program boasts of their supermarket-style food distribution center. They distribute food to 3,000 households every month. We saw another great model of Asian food banking with strong government involvements. Taichung City is the food bank model city in Taiwan. Food banking in Taiwan started by Shin-su People’s Food Bank (醒世慈愛食物銀行) in 1990. Later in 1999, the government started food distribution programs in Taiwan. In 2000, Reverend Philip Chen started Taiwan People’s Food Bank Association. Taichung Food Bank was started by Red Cross Taichung and the Taichung City Bureau of Social Affairs in 2010. Right now, TFB has 29 food distribution centers in Taichung. Each municipal district has one distribution center. TFB is the biggest food bank in Taiwan. And, Taichung City is planning to increase the number of supermarket-style food distribution center. In Taiwan, according to the Ministry of the Interior there are 614,432 people living in households defined as “low-income.” Also, there are additional 1.7 million people living below the poverty line. Taichung Food Bank serves 3,000 households every months through its 29 food distribution centers. 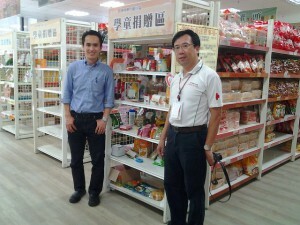 At their central center in Taichung (the supermarket-style) they serve 300 households per month. Recipients can choose whatever they want from the shelves from condiments to canned items, to frozen items, to shoes, to soaps, to diapers. 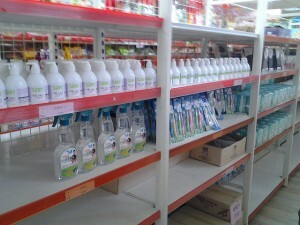 They offer non-food items such as hand soaps and vitamins. Most of their items are donated by businesses. But they also purchase some items that are donated to the food bank less often. At TFB’s supermarket-style distribution, each household receives points according to the size of their households. 2,000 points for a household of seven or more; 1,500 points for four to six; and 1,000 points for one to three. Each point is worth NT$1 (= US$3.3 as of Oct. 22, 2013). 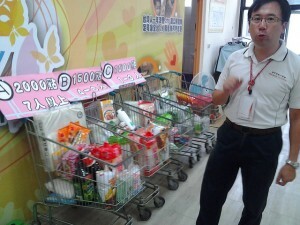 Other food banks in Asia are interested in Taichung’s food bank model. Second Harvest Asia is excited to help other food banks in Asia have opportunities to learn from Tachung’s great model soon.